The first and last time I visited San Francisco, I was seven months pregnant. I was adamant, however, that a swollen belly and slightly swollen ankles wouldn’t keep me from trudging up and down the city’s hills with their wind and sun and their views of the water. It was summer and although I’d been prepped for cool west coast weather, our week-long stay was graced with hot, sunny days. San Francisco showed us how unpredictable life by the ocean can be. How jet streams and water currents can bring with them rain or sun, hot or cold, seemingly on a whim. It is one of the reasons San Francisco is full of opposites for me. Images of neighbourhoods, of streets and houses and apartments, of trees and tram stops and people, all viewed from above and then again from below. I have this sense of San Francisco as a city that is always moving up and down, where people are looking high and low, out to sea and then back again toward a hilly landscape. Of winds rushing low over the earth and then being whipped back to the sky. This is a feeling that stayed with me when I read Shelley Singer’s superb mystery novel, Samson’s Deal (amazon.ca / amazon.com), about Bay area detective, Jake Samson. Jake does a lot of roaming around the neighbourhoods of Oakland and Berkeley, from quiet house-scattered hillside suburbs, where nothing ever happens, to busy university locales, filled with protesters and fire. He’s constantly in motion, going in and out from his house, meeting good people and bad, eating and drinking, but always coming home to a long bath, sometimes with a dinner of tinned oysters. Singer reveals Jake’s intelligent, gracious character over the whole span of the novel, though you do get a good sense of who he is right from the start. From the kind of friendships he has with his poker buddies, his tenant and sometimes partner, Rosie Vicente, and the various beautiful women he meets along the way. From the way he studies the murder of the artist wife of a Berkeley professor, going over and over the details that he uncovers until something breaks and he can chase down another avenue. From the way he deals with violence, done to others and to himself – the first with a strong sense of integrity and justice, so that he finds the murderer even after he’s been paid to stop searching; the latter with a mere hint of annoyance, a touch of concern. From the beginning I thought of Jake as a very comfortable character, one I’d enjoy getting to know and follow through the course of the novel. But he does still manage to surprise you – in the way he dresses, his observations on everything from food to relationships, and his effortless ability to pick up women. Add to these his dogged determination, his steady sense of honour, and his love for cats, and there’s no wonder the Jake Samson series is such a treasured favourite among mystery fans. Jake deals with little physical evidence; instead, he talks to people. He uses a journalist cover to learn the ways of his suspects, a psychologist’s sense of the weaknesses and failings of regular human beings to ferret out their secrets and get to the very bottom of who they are – and what they are capable of. In the same way, we also get to hear the inner workings of Jake’s mind, usually with a humour and unique wisdom that make Jake Samson a truly great detective character. The kind of character you’re willing to read more about and follow through the next books in the series. 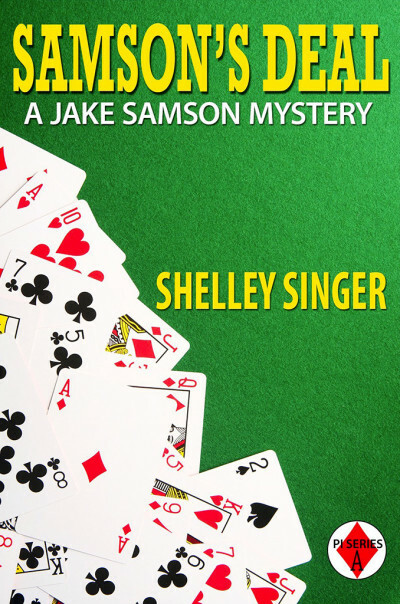 Luckily, Samson’s Deal, is just the first of six Jake Samson mysteries to be published in e-book format. Singer promises to launch the rest soon. For me, that day can’t be soon enough.